The sun had gone down in Laos by the time I finished dinner, and I realized I was lost. A video clip from Lao News TV on July 9 2014 shows members of the highest levels in the Lao National Assembly openly discussing the logging and deforestation issue in Laos. While concrete action still remains to be seen, openly discussing the issue is certainly a step in the right direction. Just in case you might have missed it, last year on December 8 2014, the US Embassy in Vientiane had its official opening at its new location in ban Somvangtay. It took 2 years to build at a cost of $145M. It moved from its downtown location on Bartholonie road to its new home on Tadeua road southwest from downtown Vientiane. It's hard not to miss it as you drive along as you'll find a large area dominated by this new facility complex with its buildings surrounded heavily with tall fences and gates. The only other embassy in Vientiane to occupy such a large single area is the Russian Embassy at Sokpaluang road. Below is a video clip from Lao News TV profiling the opening ceremony. Here's a profile on the Lao women's competitive rugby team and some of its members. Many people may not even know rugby is played in Laos let alone by female athletes. It's a wonderful video and even more so it's inspiring to see the young women be fearless in participating in a rougher sport that's typically dominated by men. Vat Simeuang in Vientiane is arguably one of the most visited temples in the city. It even receives tour groups. The grounds have been redone and it continues to look nicer each time I see it. 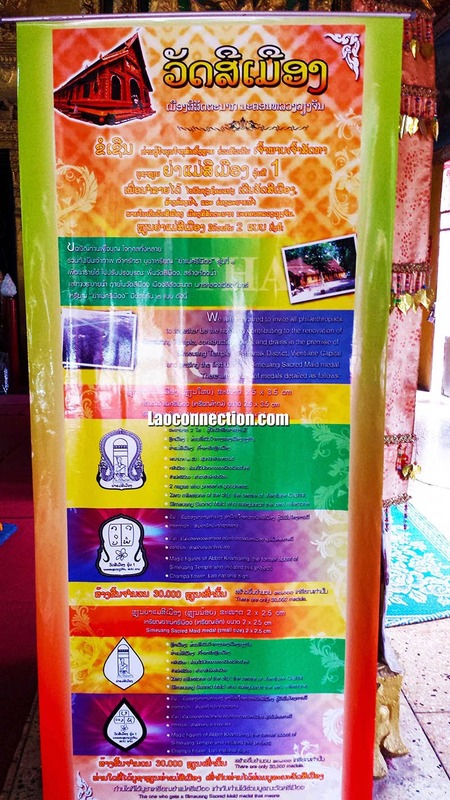 Here's the entrance poster to the temple explaining some info on the temple and amulets for sale. Monday, February 9, 2015 - We reached 200 likes on Facebook! 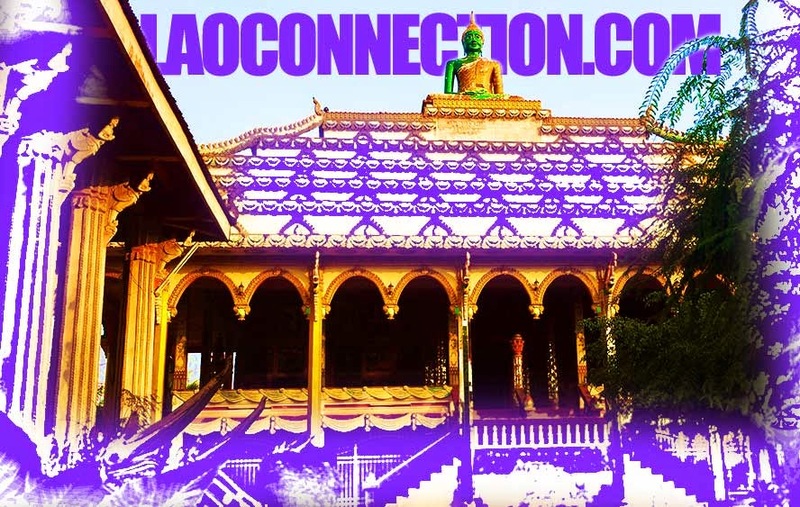 A new milestone for Laoconnection.com. Thanks for liking us! 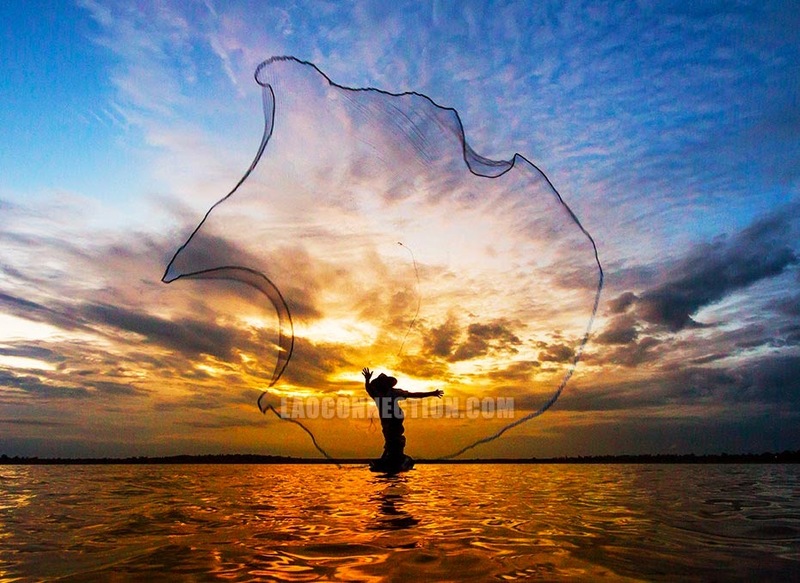 And as always please free to connect with us on FB or here on the blog. 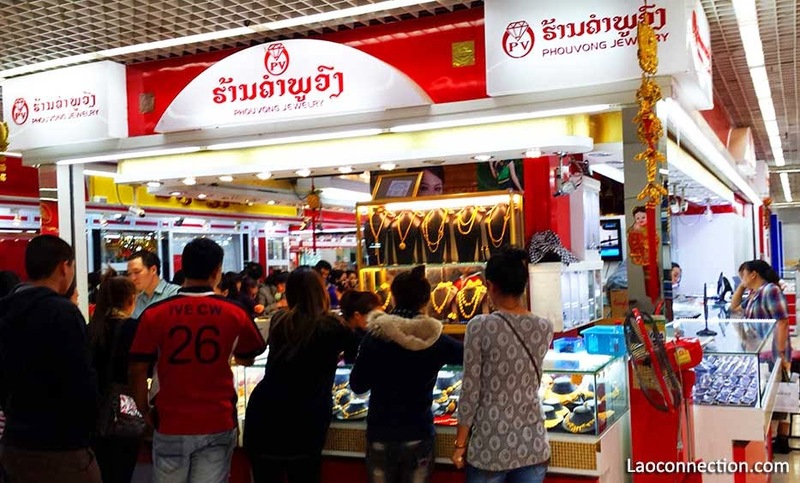 In Vientiane there are plenty of jewellery stores. In particular, if you've ever visited the Morning Market Mall, you'd see them all clumped together side by side. However, I always noticed that one store in particular was always busy and bustling with customers. It's called Phouvong Jewellery Store (han kum puvong). They used to only have one location but when the mall was redone into two primary buildings, they decided to create a duplicate store in the second building. 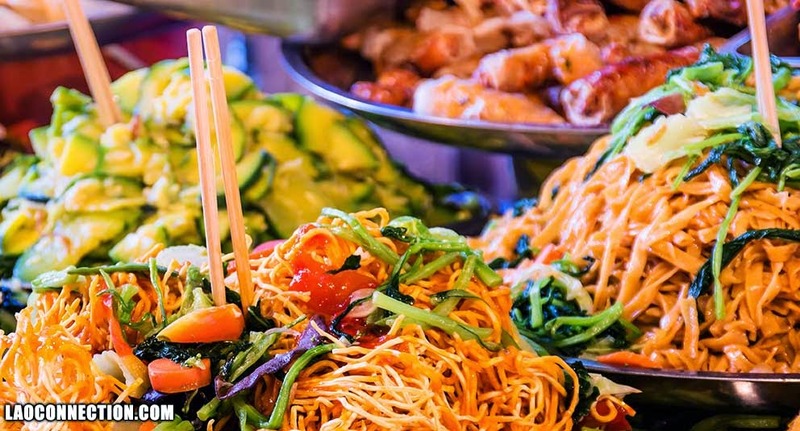 If you ask most people what there number one food memory while in Luangprabang is, odds are the answer is likely to be the food market that springs up in the evening. It's down a narrow corridor between two larger buildings. You'll find yourself dodging other food-goers and quite often shoulder to shoulder as you pass other people as it is usually busy. 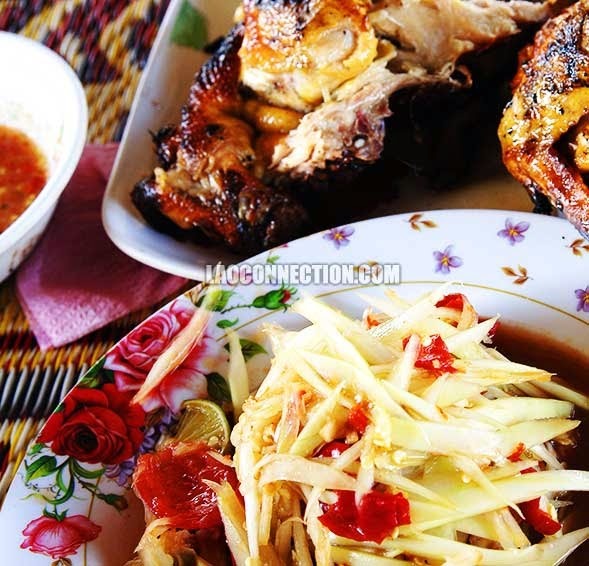 In Laos, one of the most common and delicious meals to be had is pictured here. 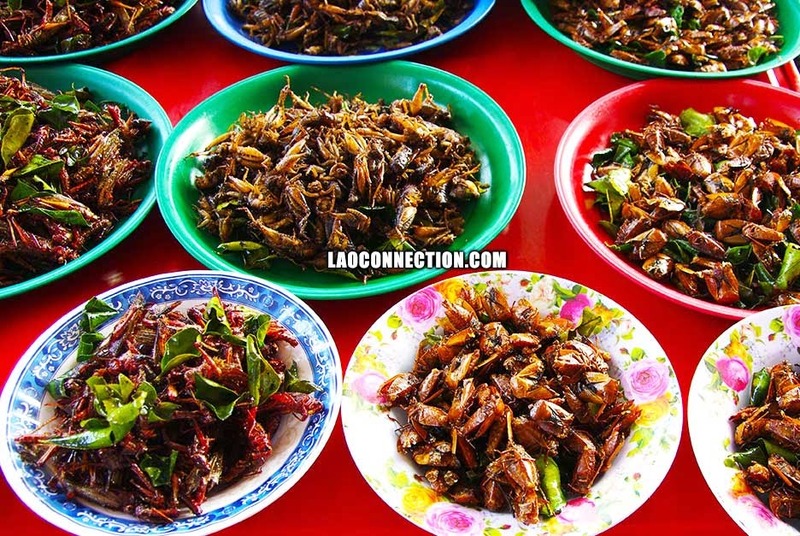 They're often sold at restaurants, food markets and side street vendors and can easily be considered Lao versions of fast food (but totally healthier of course! ).